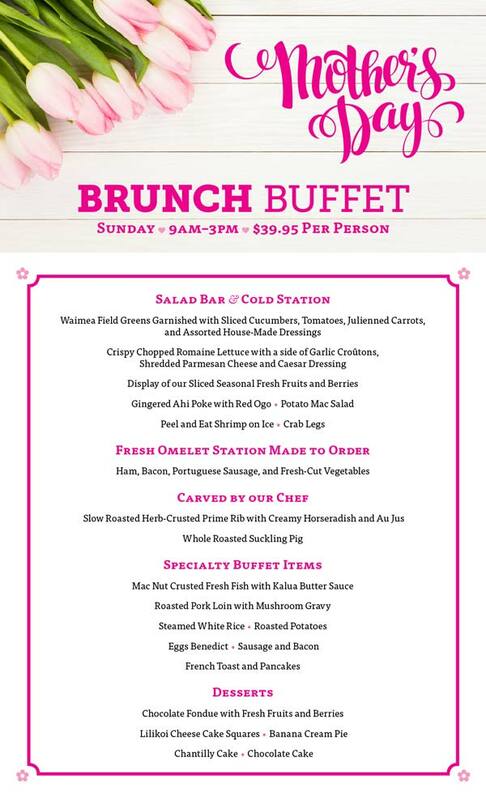 Join us for Humpy’s Mother’s Day Brunch Buffet on Sunday, May 15th! Mom will love our Crab Legs, Slow Roasted Herb-Crusted Prime Rib, Whole Suckling Pig, Mac Nut Crusted Fresh Fish with Kalua Butter Sauce, and of course our famous Chocolate Fondue with Fresh Fruits and Berries — and you can enjoy some fresh craft beer! Come on down and enjoy the buffet from 9am–3pm. Only $39.95 per person!